This country has always held a special fascination for Hans. That’s why he keeps going back. For his how-to video “Monkey See, Monkey Do”, Hans rode his GT mountain bike off a high bridge with a bungy cord, and plunged completely underwater before being ripped back up into the air still attached to his bike. He also rode the edge of treacherous white water rapids and even herded a few sheep. More recently, he did the unthinkable. 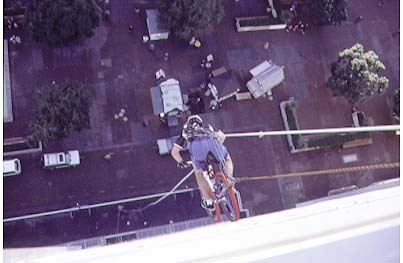 As a publicity stunt, Hans rode down the vertical face of an Auckland high-rise. Utilizing a specially designed harness and braking system, Hans descended the 13 stories straight down.